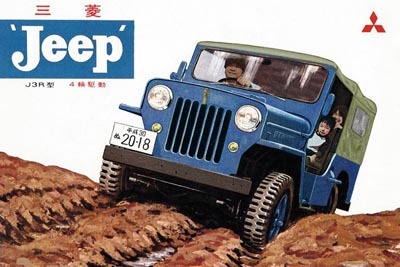 Every year since the mid-1990's, Hidemi Hishikawa, who lives in Yokosuka, Japan, has sent out a New Year's card with an illustration based on his blue Mitsubishi J3R Jeep. He has done artwork in a variety of styles, including in recent years composite photographs putting his family and Jeep into "impossible dreams." Hidemi says, "This is my New Year's card of 2019. The theme is 'my daughter's departure.' She will be a junior high school student this year. In Japanese public transportation and hotels, junior high school students and above will be 'adult rates.' It is encouragement for my daughter. 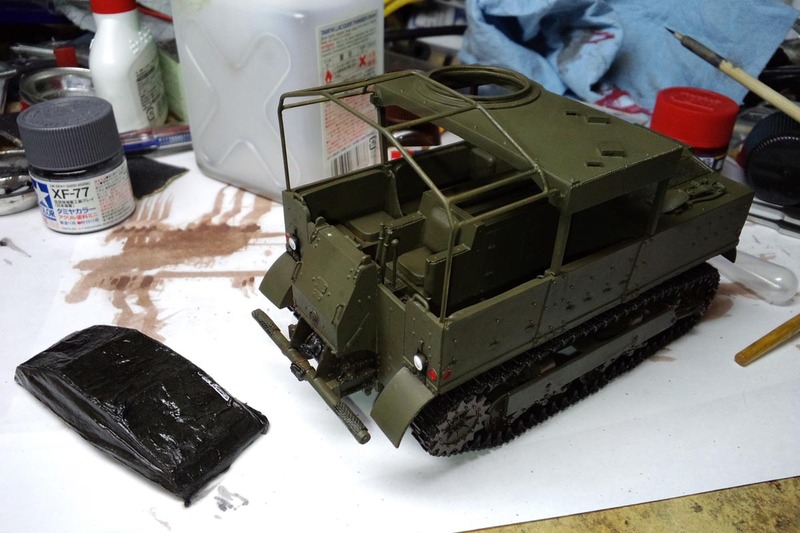 "This 'Kettenkrad' is a 1/9 scale kit which ESCI released in 1975. Recently ITALERI reproduced it. It has exquisites molds, but the detail is quite different from the real one. Still, a big kit is fun to assemble. 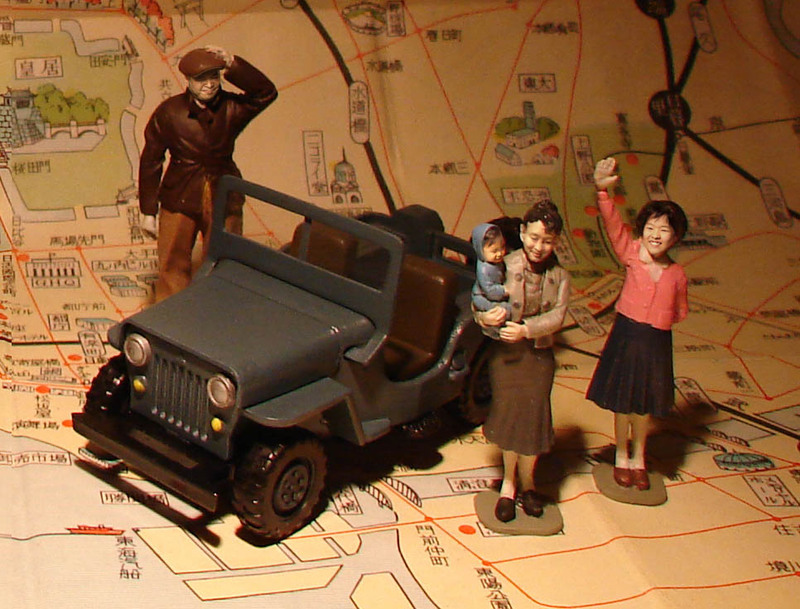 For 1 January 2018 Hidemi put himself and his family into a famous 1960s Mitsubishi CJ3B brochure. Also during 2018, he made a bit of video art for YouTube: a 22-second clip of him starting his Jeep with the hand crank. 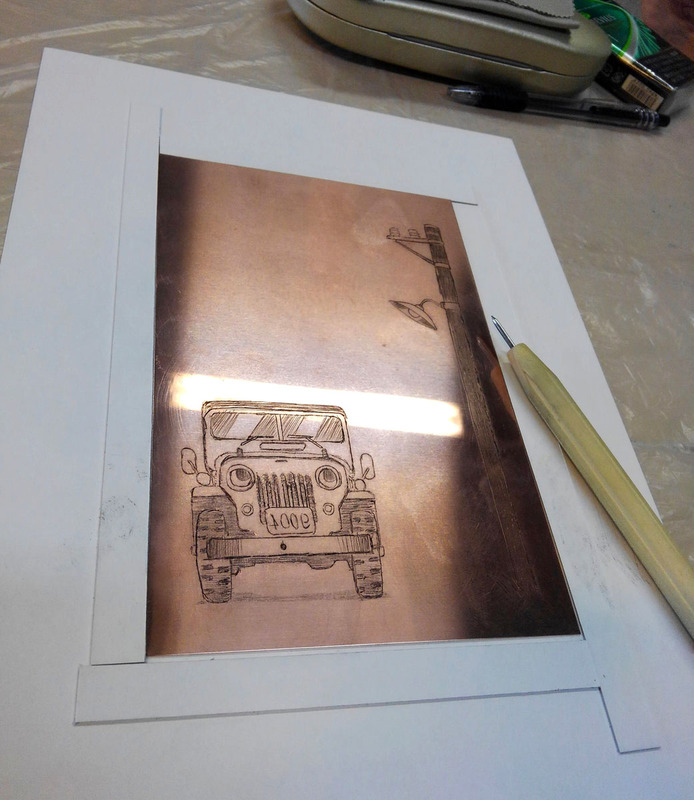 Another recent piece of Jeep artwork from Hidemi is a print produced in the traditional medium of engraving on a copper plate (190K JPEG). It's a technique that has been used since the 1400s to allow the reproduction of drawings and maps. Ink is rolled onto the plate and then wiped off the smooth surface, remaining only in the etched lines. The plate is then run through a press with a piece of paper. Hidemi likes experimenting with different art forms, and although he has previously done woodcuts (see below) he says this is his first experience with engraving copper. 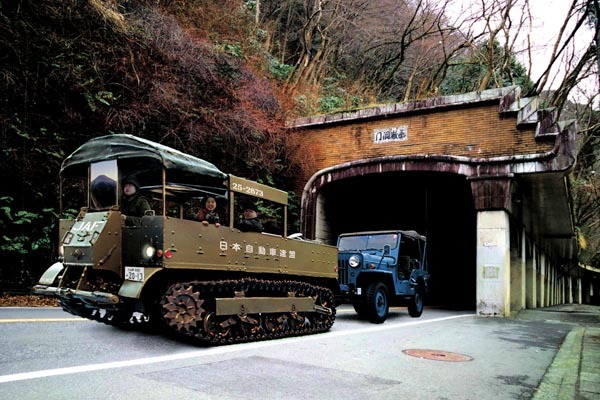 As usual, the subject includes his Jeep, a 1963 CJ3B-J3R built in Japan by Mitsubishi. Hidemi says, "The base model is a plastic miniature sold by Japanese model manufacturer "IMAI". Scale is 1/72, and the 1st edition was released 50 years ago. 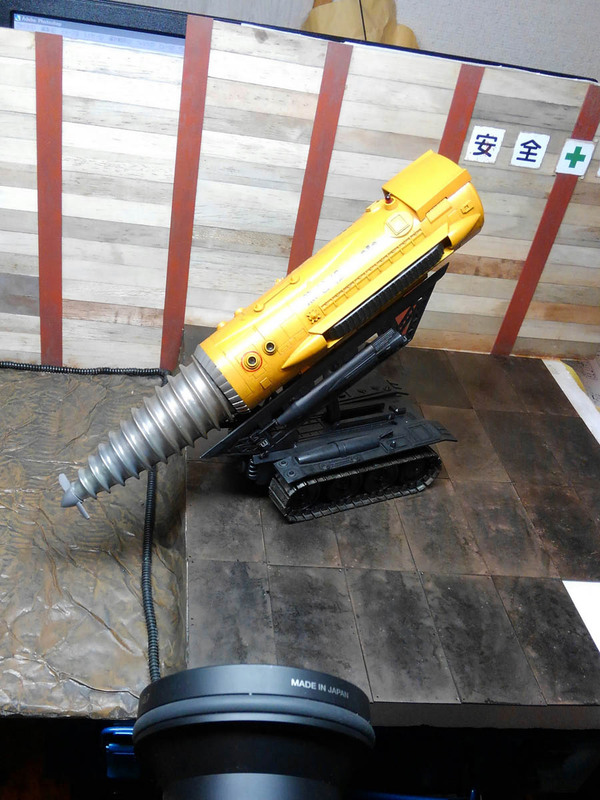 The drill revolves electrically and a warning light flashes on and off. Very nice kit. I shot a film test to decide on the angle (170K JPEG), and the final picture was taken outdoors." The 2016 New Year's illustration was an elaborate still life, imagining the nostalgic story of a family vacation. 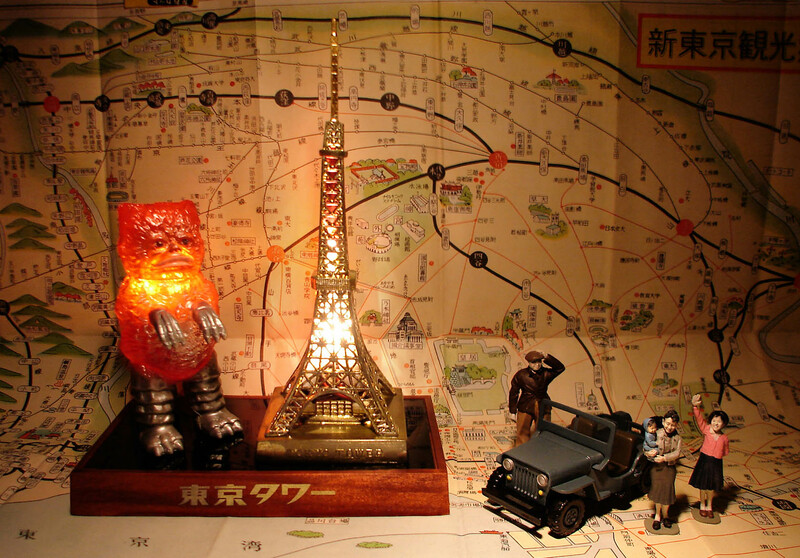 On the left is an actual 1960s souvenir model of the "Tokyo Tower", built in 1958, combined with the monster "Garamon" from the 1966 Japanese TV series Ultra Q . Garamon is known as the monster who broke the Tokyo Tower (500K GIF). 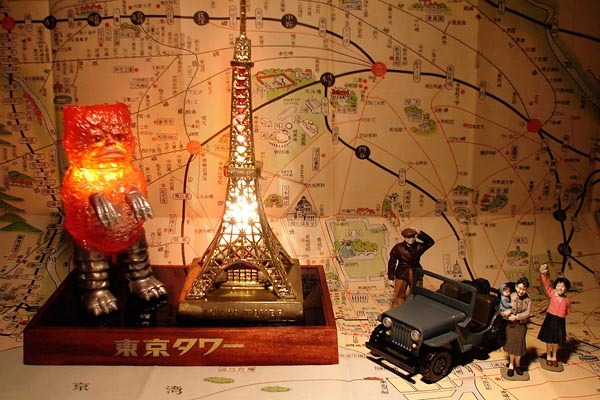 Hidemi installed a light inside the Garamon doll, and made the wooden base to create an imaginary souvenir lamp. The miniature Jeep is from a well-known Japanese series of 1/40-scale diecast toys called Diapet, from Yonezawa Toys. Hidemi says, "I bought it as junk goods (150K JPEG) and restored it (120K JPEG). The windshield was lost, so it was made again by me with an aluminum plate. The figures of the family (120K JPEG) are 1/35-scale, and their faces are real photographs of my family." "The sightseeing map in the background is a real map of Tokyo in the 1940's.Yes, under occupation by GHQ. 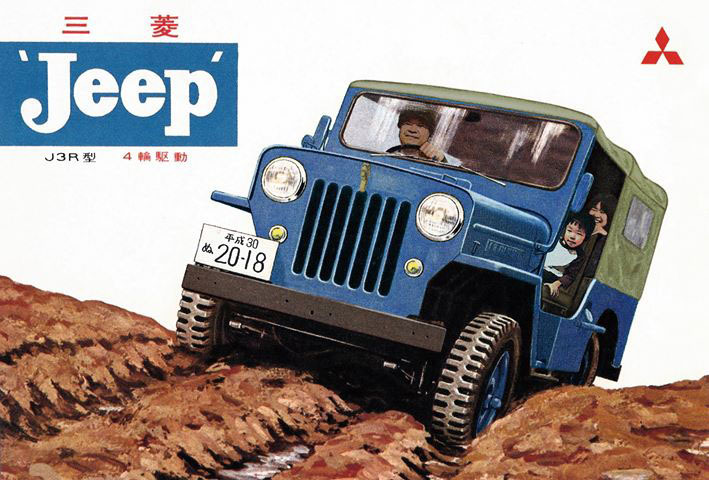 Many American Jeeps ran about all over Japan. Jeeping life is also the study of history. It's interesting and exciting." "My grandfather passed away in 2014, and a family in mourning wouldn't celebrate New Year -- it's a Japanese custom. So for 2015 I sent a postcard of 'Winter Greeting', not a New Year's card. I chose a silent motif in honor of my grandfather. 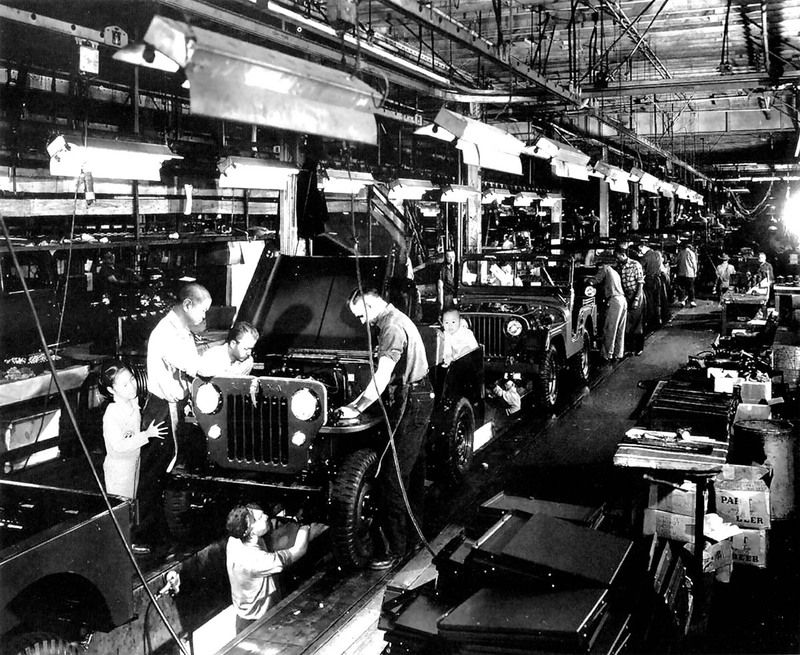 "The famous picture of the Jeep line in Toledo (see Working at the Overland) was most suitable as a subject. I made me and my daughter appear in the picture, and my son who was born that year. 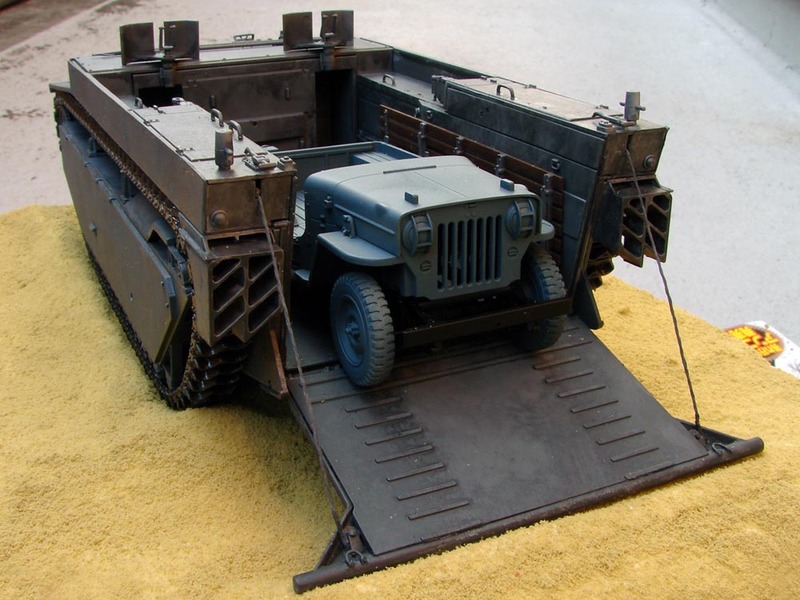 A new Jeep rolled out at the Willys factory, by us (280K JPEG). It's a great dream." "At New Year's 2014, my grandfather had been in critical condition. So a subject which seems fun was avoided. Still I made the Jeep appear! 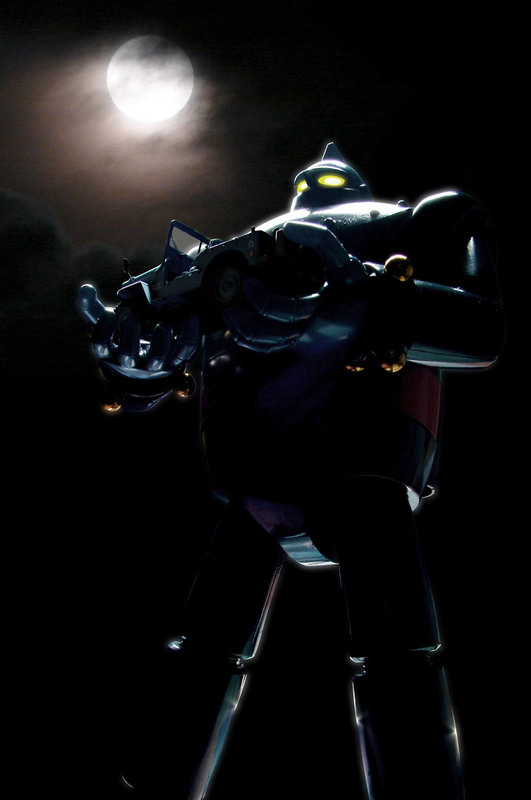 The giant robot IronMan 28 is famous in Japan, and known as 'Gigantor' in the rest of the world. Gigantor is lifting my Jeep gently (110K JPEG). 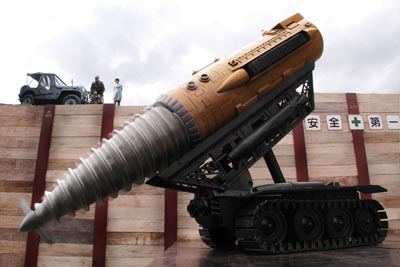 "And Gigantor has a relation to my grandfather. A long time ago, Gigantor comics were in grandfather's bookshelf. Every time I went to grandfather's house once a year, I was absorbed in reading this cartoon. And the comics were inherited by my brother." "The M5 tractor is a 1/35 scale plastic kit (90K JPEG) and is lettered as belonging to Japan Automobile Federation (JAF, equivalent to AAA in America.) Me and my daughter get on a tractor, driven by my wife! "The tunnel was built in 1931 and used until 2014. The picture was taken by me at the Kanrei cave in Hakone which is a famous Japanese tourist spot. We can't pass through there now, but it's preserved as a legacy of engineering works." For his 2012 New Year's card, Hidemi said, "Although it was 'sea' last year, 'sky' is the stage of this year's card. The airplane is Sikorsky H-19 that's a famous helicopter worldwide. In Japan, this helicopter is loved by many maniacs who ride old Jeeps, because H-19 is co-starring with CJ-3B frequently in monster films! "The background of this photograph is Mt. Fuji which is the mountain most famous in Japan, and this is also a mountain which symbolizes the New Year. In many monster films, the duel of monsters is performed at the Mt.Fuji foot. "If hung by the helicopter, riding on Jeep, will I feel it very exciting? Or...fearful?" In 2011 Hidemi had said, "The theme is the same 'impossible dream' as last year. though it is a sea journey this year, and it was the railway last year. The famous LVT (Landing Vehicle, Tracked) landing on our secret beach is the plastic model (130K JPEG) in 1/35 scale from Italeri. The crew of the Jeep is me and, of course, my daughter. "Finished it up like an old picture postcard. Meaning of the message written in the upper right of the picture is 'I went to a happy excursion with my dad.' If I think realistically, taking the LVT is impossible, however I will make a lot of happy memories in the Jeep this year with my family." The illustration on Hishikawa's 2010 New Year's greeting card (below) was called "Impossible Dream." It shows his Jeep riding on a vintage train, with his daughter on the caboose. He writes, "How happy if such a trip could be done!" The EB10 type electric locomotive was one of two built circa 1931, and in use until 1971. See a 1965 photo (100K JPEG) of EB101 in service, courtesy of rail.hobidas.com. The caboose was built in 1974, but in Japan as in North America, the caboose is a thing of the past. 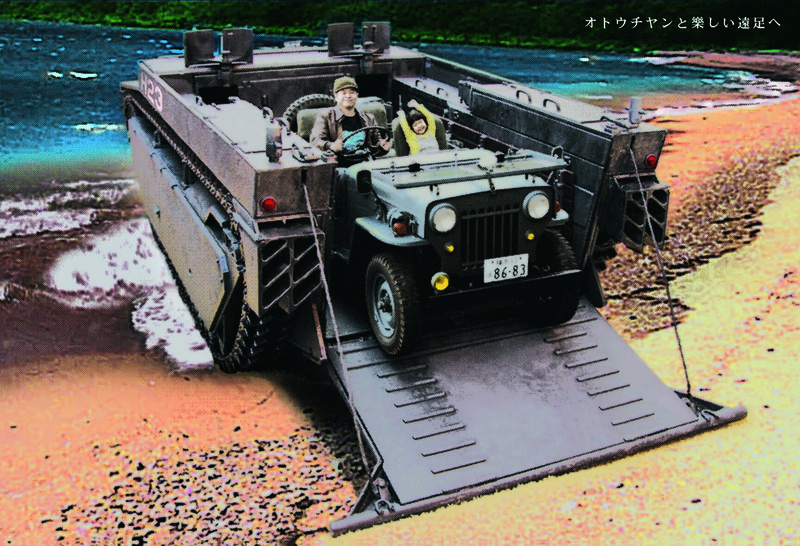 Hishikawa's 2009 New Year's card had a theme many of us are familiar with: "Daughter who plays with the Jeep." He says that among his happiest memories of the Jeep are memories from taking it to the sea with his daughter last summer. 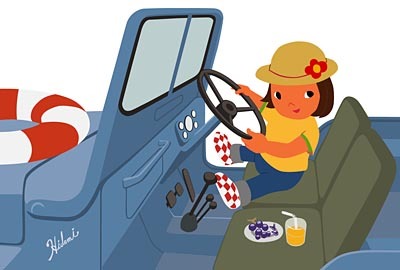 She likes to sit on the driver's seat, gripping the steering wheel and the shift knob, with the engine stopped of course. And she loves to eat grapes. 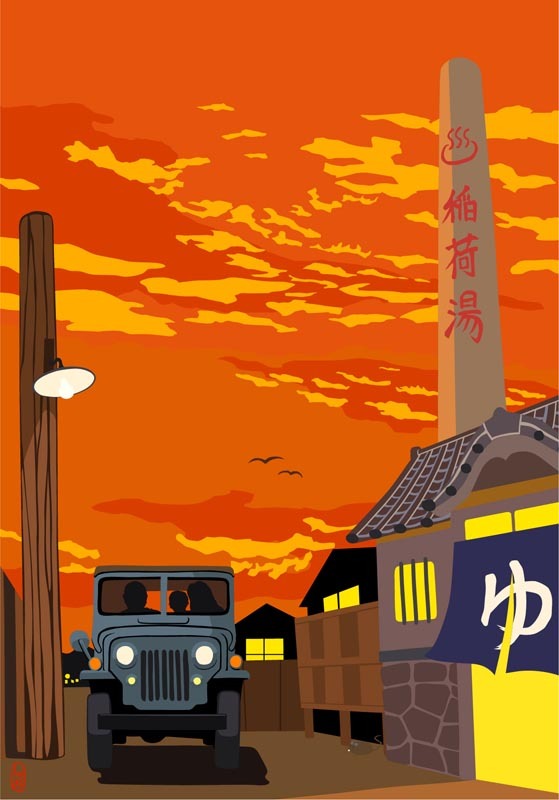 The 2008 card (70K JPEG) shows the Jeep beside a traditional Japanese spa, with a beautiful sunset sky in the background. These pieces are all based on the same 1963 J3R high hood built by Mitsubishi in Japan (right). The work seen here ranges from drawings to a 3D computer rendering, a woodcut, and action photographs. The picture of children on a "Jeep hike" was drawn on the computer using Photoshop. The red signature on the left is Hidemi's nickname "Abura" which means "oil". Kids love Jeeps! This illustration created in Softimage3D was for a 2004 New Year's card. 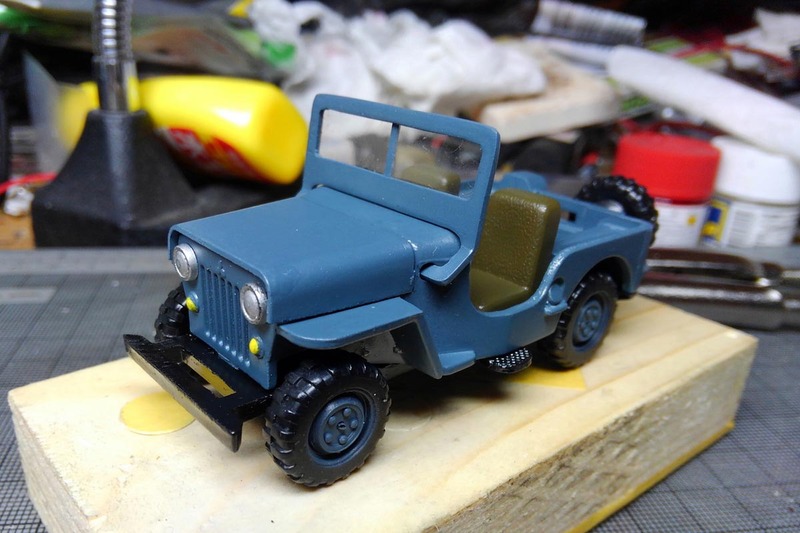 Abura's's right-hand-drive Jeep is a civilian model with chassis number 63J3-31015 and Hurricane engine number JH4-131589, but he likes the military look and has a blackout lamp and military-style canvas top. 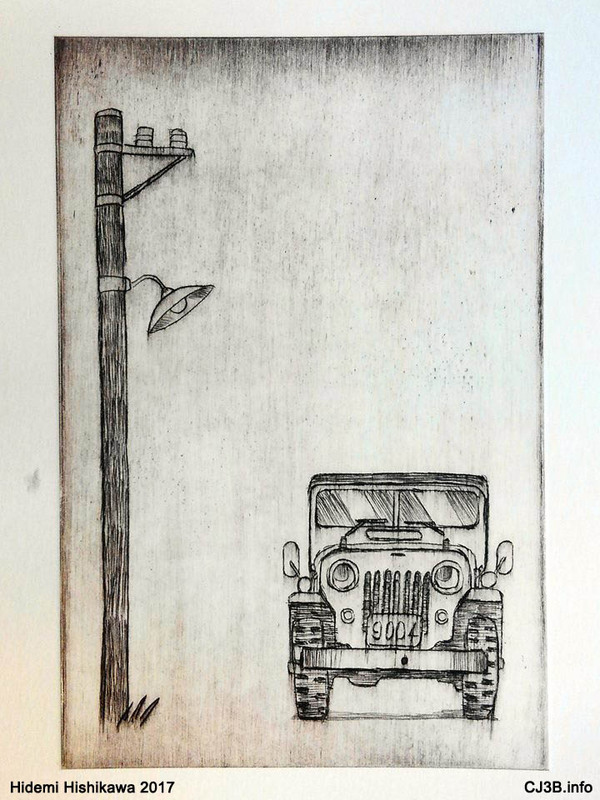 The image of two soldiers of Japan's Self-Defense Force camping out with their Jeep, is done in a much more traditional medium -- a woodcut. 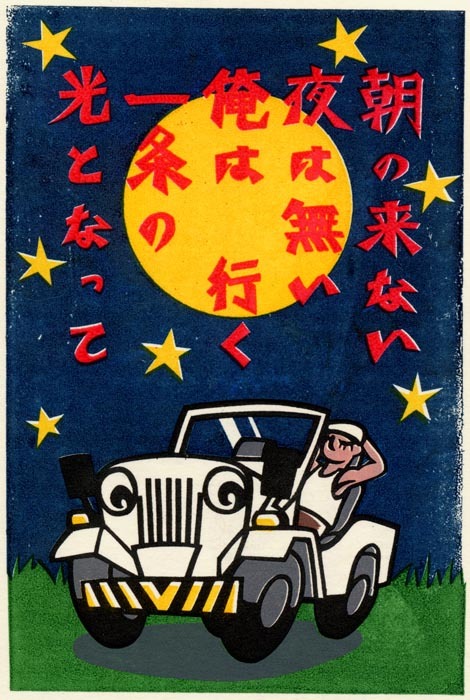 A 1996 silkscreen (120K JPEG) shows a driver relaxing in the moonlight, with a poem which Abura translates as, "I will run without giving it up because it starts without fail in the morning." Back to the computer for a picture made using Adobe Illustrator, for a New Year's card in 2005 (right). 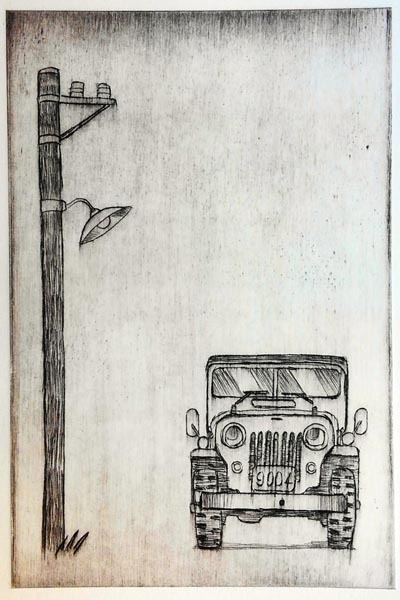 And another woodcut for New Year's 2006 (100K JPEG): note that it includes a three-wheeled Japanese truck called the "Midget", and a dog sleeping. (The dog is the animal symbol of 2006 in Japan). 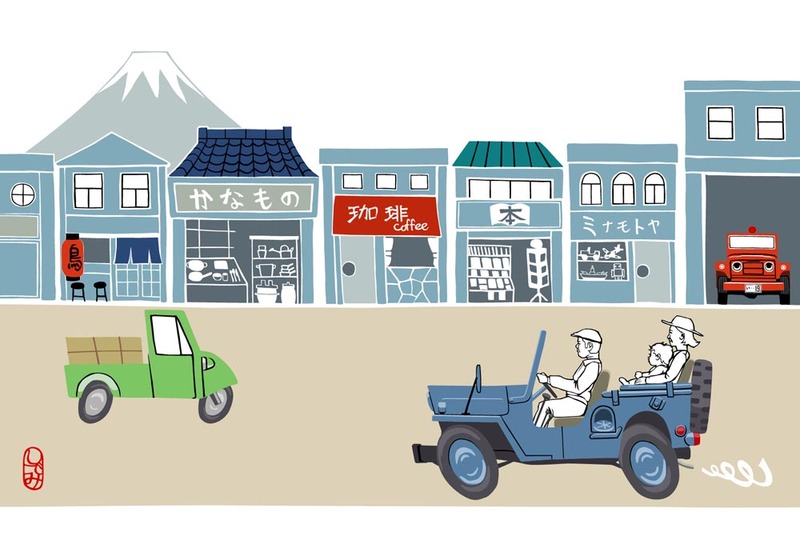 For New Year's 2007 (120K JPEG) an Adobe Illustrator piece shows the Jeep with a classic Japanese shopping street in the background. Abura comments, "It is scenery being lost in Japan. The mountain drawn in the left side is Mt. Fuji, highest in Japan. It is an old tradition in Japan; having a dream of Mt. Fuji at the New Year is very happy occasion. An old Datsun Fire Patrol is in the fire station on the right side. The number of the license plate is 19, the new year's number in the Japanese era." 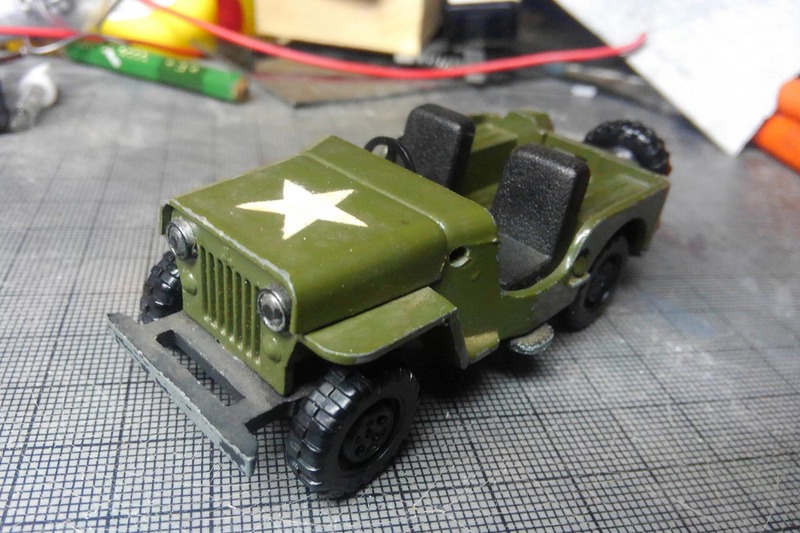 The Jeep also has the hood from a military version, which has some minor differences including a bulge on the right front to accommodate the position of the oil filter in the military J4. 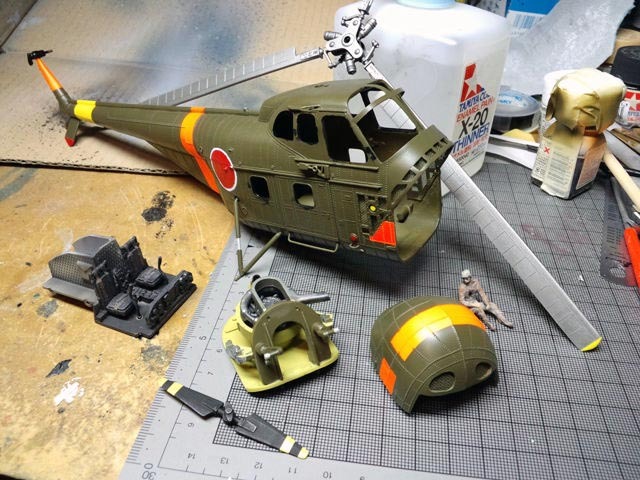 The color Abura chose is a medium blue based on U.S. Navy fighter camo from World War II, using Tamiya model paint as a sample. Here we see where Hishikawa gets his nickname "Oil". In this 2002 photo he's rebuilding the suspension. He overhauled the engine in 2004 and replaced the transmission with one he says came from a surplus fire engine. 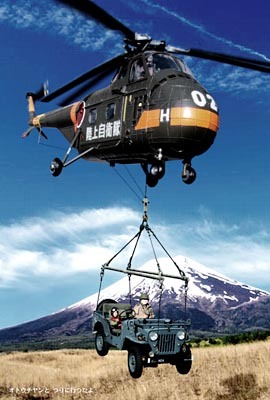 Also on CJ3B.info, see High Hood as Art, and the Mitsubishi J53 Jeep Photos of Hideo Yoshii. 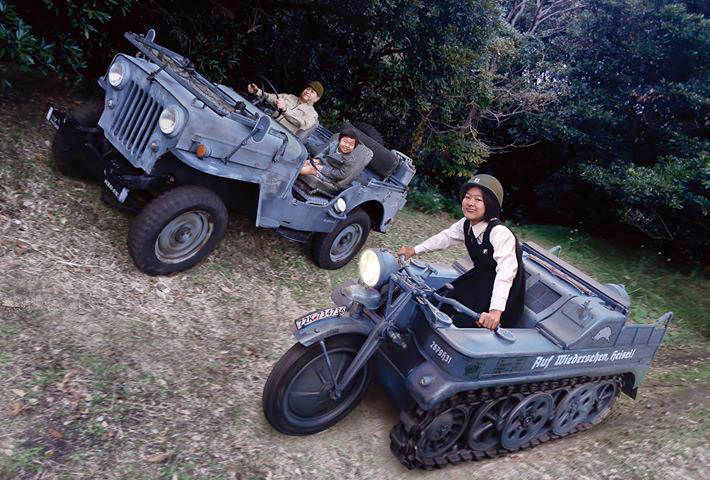 See more Mitsubishi Jeeps on CJ3B.info.